You’re excited about an innovative new technology that’s been proven to work in controlled settings. But will it work when incorporated into a product in real-world conditions? This 8-Point Assessment Checklist, developed over our two decades in this business, is your blueprint for finding out. Follow it early in development and it can save months or years of frustration and millions of dollars on fruitless efforts to make something work that just won’t. • How to gauge your technology’s performance, both within the best-case scenario and in suboptimal conditions. • Which aspects of your technology are sensitive to changing environmental conditions, and how to reduce that sensitivity. • How to determine whether your prototype technology can be mass-produced such that it works the same way every time. 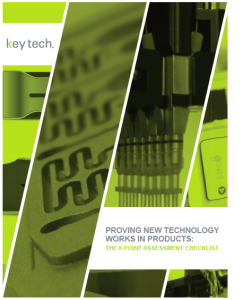 Don’t begin your next technology development project without first reading our Assessment Checklist.